When Indra, the lord of rains, showed his wrath on the people of Vrindavan, with violent rains and thunder, lord Krishna lifted the Govardhan Mountain like an umbrella and saved the inhabitants – the cows and cowherds, from Indra’s fury. Indra was humbled and the people started worshipping Govardhan, the giver of rains and green pastures. Legend has it that in 1409 AD, an image of lord Shrinathji, the mountain lifting form of Krishna, was discovered when a cow worshipped the lord with offerings of milk. A temple was established there and was held in high reverence. In the year 1671 AD, in anticipation of the Mughal king Aurangzeb’sraids, the temple was shifted to Rajasthan, where it would be safe in the hands of the Rajputs. Maharana Raj Singh decided to provide refuge.Along with the idol of Shrinathji, the lord’s sevaks – the priests, halwais (confectioners), cows and their care takers and the Pichwai painters (painters of temple background art) also went along. They stopped at Eklingji in Rajasthan, where there was a momentous temple of Shiva, but since two temples of great importance cannot exist in one city, they moved on further. At one point, the bullock cart got stuck in the ground and would not budge. So it was decided to establish the temple of Shrinathji there in the city of Nathdwara, (Nath – Lord, dwara – gate) meaning “the gates of the lord”. 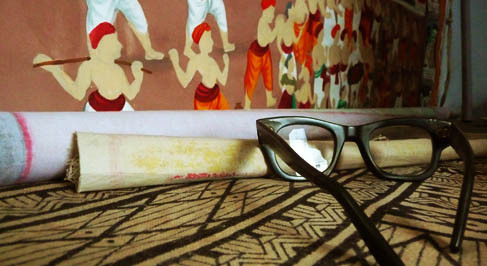 Pichwai paintings are works of art that are used to adorn the walls of temples, behind the idol. 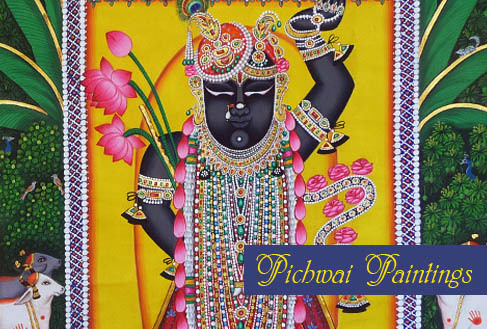 The Pichwai style is from the Nathdwara School, and is identified by characteristic features of large eyes, broad nose and a heavy body, similar to the features on the idol of Shrinathji. Different paintings are made for different occasions, different seasons,festivals, and so on. While the painting has pink lotuses in the summer, the painting for Sharad Purnima is a night scene with the bright full moon. Themes such as Raas Leela, Holi, Annakut (Govardhan Puja) are also seen in their relevant occasions. 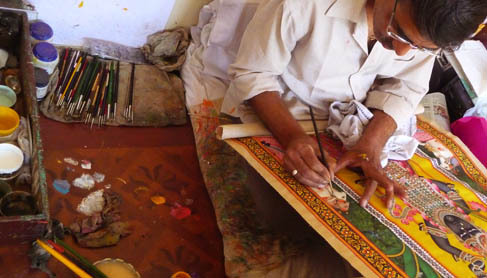 Sometimes rich embroidery or appliqué work is used on the paintings. Enclosed in a dark border, rich colours like red, green, yellow, white and black are used, with a lot of gold decorating the figures. On a starched cloth, the painter first makes a rough sketch and then fills in the colours. Traditionally natural colours and brushes made of horse, goat or squirrel hair were used, but now faster and less expensive material have replaced them. One can still find many paintings done with natural colours only. The use of pure gold in the paintings adds to their value and charm. For one painting, it may take 3-4 days to just prepare colour from pure gold. 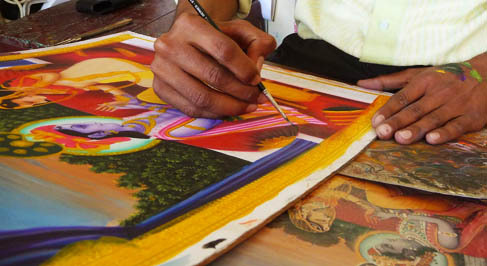 Pichwai Artist ~ Shyam Sunderji Sharma, Nathdwara A Pichwai painting for the temple backdrop can take from a couple of weeks to a few months to prepare. Wealthy families commission paintings for the temple, but for the common man, there are smaller versions to take home into their personal shrines also. 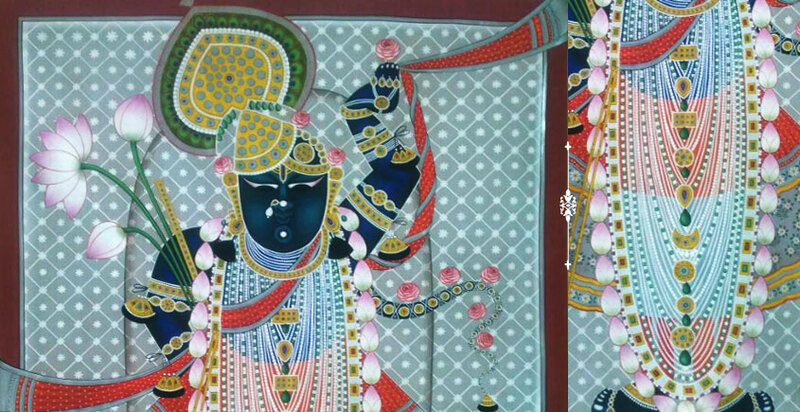 Since photography inside the temple is not allowed, paintings representing the idol of Shrinathji are also made by the Pichwai painters in the same style, earning them business and satisfying the devotees who want to take an image of their lord with them, both at the same time. Located in the Aravali hills, on the banks of the Banas River in Rajasmand District, just north of Udaipur, Nathdwara is a major pilgrimage destination. The lives of the people, their occupation, all revolves around the temple. 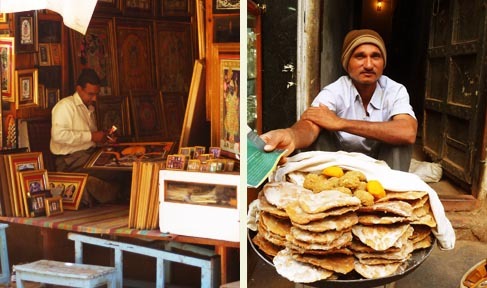 From garments and jewelry for the lord, to food offerings, paintings, hotels for tourists etc, the town thrives on business generated because of and for the temple. Even after 400 years, the rituals and traditions and the devotion towards Shrinathji remain the same. 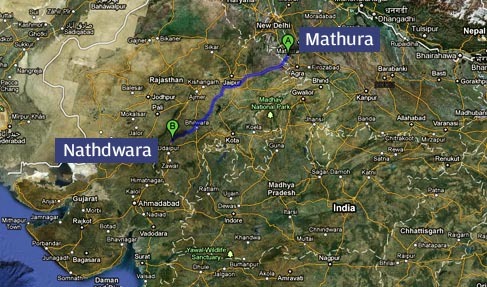 The town shows a strongercultural influence of Mathura (Uttar Pradesh) than Rajasthan. 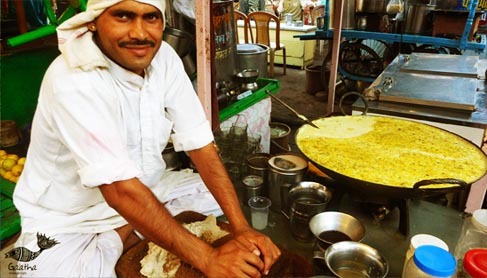 With the market full of halwais making kachauris and rabris, speaking in Awadhi, one may not realize that this is a town in Rajasthan, not the streets of Mathura. Note -These paintings are hand-made and unique, these may differ slightly from the snaps seen on digital screen. -The paintings will be shipped in rolled form. -We would suggest the buyers to frame these paintings with caution. When Indra, the lord of rains, showed his wrath on the people of Vrindavan, with violent rains ..